Buah pedda is a fruit from the tropics. It it can be seen growing everywhere from East Africa to Australia. 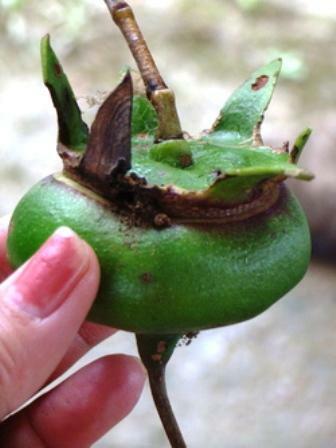 This fruit has not been introduced much in Tropical America. It bears persimmon like fruits with attached sepals. The tree grows mostly in brackish water near the banks of tidal rivers. 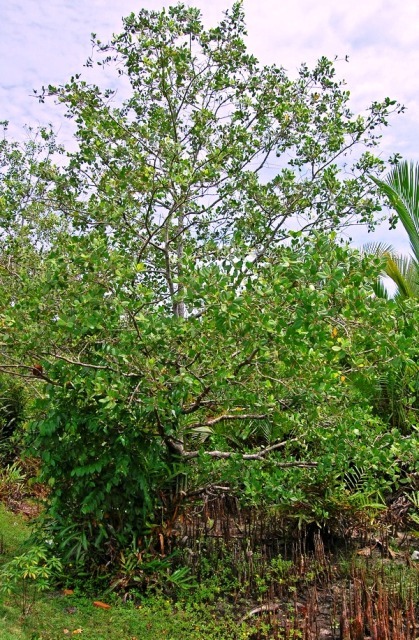 An evergreen tree 5–15(–20) m high without buttresses or stilt roots, with rather open spreading crown, glabrous throughout; pneumatophores 50–90 cm high, to 7 cm in diameter; bark gray, coarsely flaky. Leaves opposite, without stipules, nearly sessile, elliptical, oblong or ovate, 5–13 cm long, 2–5 cm wide, with broad or tapering base and blunt or rounded tip, entire, with 8–12 widely spreading fine side veins on each side, leathery. Flowers 1–3 at end of drooping twigs malodorous, nocturnal. Hypanthium with 6–8 calyx lobes; petals 6–8, 2–3.5 cm long, 1.5–3.5 mm wide, dark or blood-red, stamens numerous, with threadlike filaments 2.5–3.5 cm long, pistil with 16–21-celled ovary with many ovules; style long, stout. Seeds 100-150, tiny, white, flattened and buoyant, edible. The fruits are eaten raw. When fully ripe, these taste like cheese. The fruits are also cooked. The fruits are rich in pectin. A clear jelly can be made from them. Young fruits are used to flavour curries. 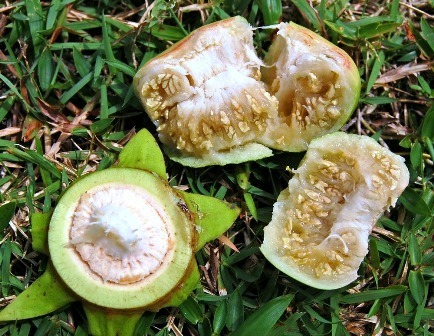 Buah pedda fruits have many medicinal uses. Fermented fruit juice is said to be useful in arresting haemorrhage. The wall of an old fruit is given as a vermifuge. The juice of half-ripe fruit is used to treat coughs. 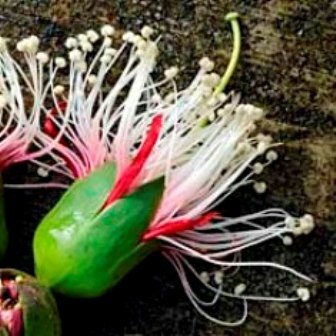 The juice of the flowers enters into a compound for treating blood in the urine. The fruits are collected from wild growing trees only and these are not reported to be cultivated anywhere.